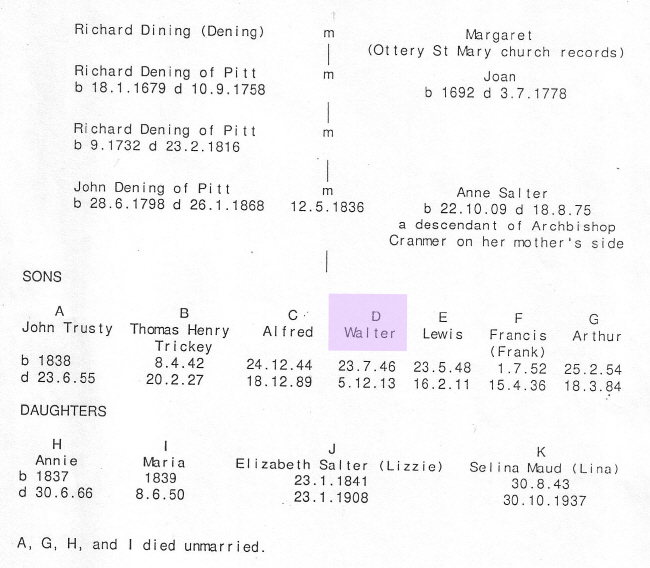 Richard (Tim) Dening could trace his family tree back to the late seventeenth century. At this time, the Denings lived at Pitt House (built 1600, now Pitt Farm) near Cadhay, 2 miles from Ottery St Mary, Devon, UK. Records show they lived there from 1690 (and perhaps before that) to 1878. The Dening Vault on the N.W. side of Ottery St Mary churchyard was built in the 17th Century. 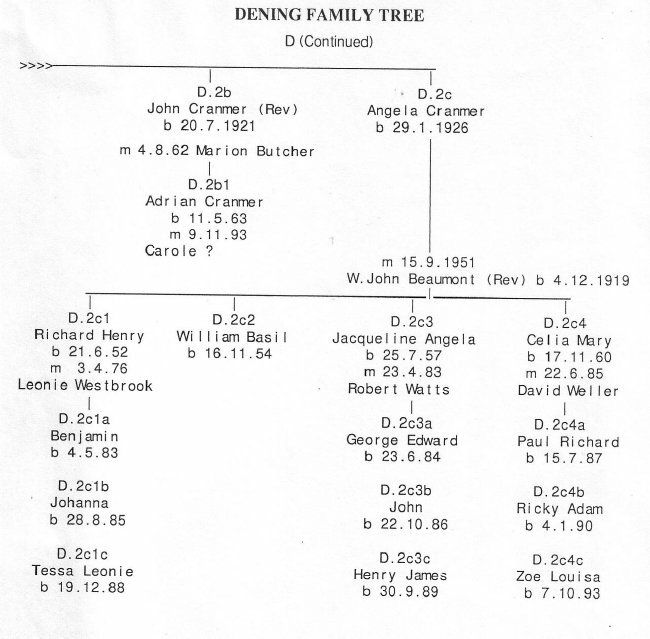 In the following family tree, some of the birthdates may be dates of christenings from church records or from ages on tombstones. It was traditional for the oldest son to be called Richard and the younger son, John. 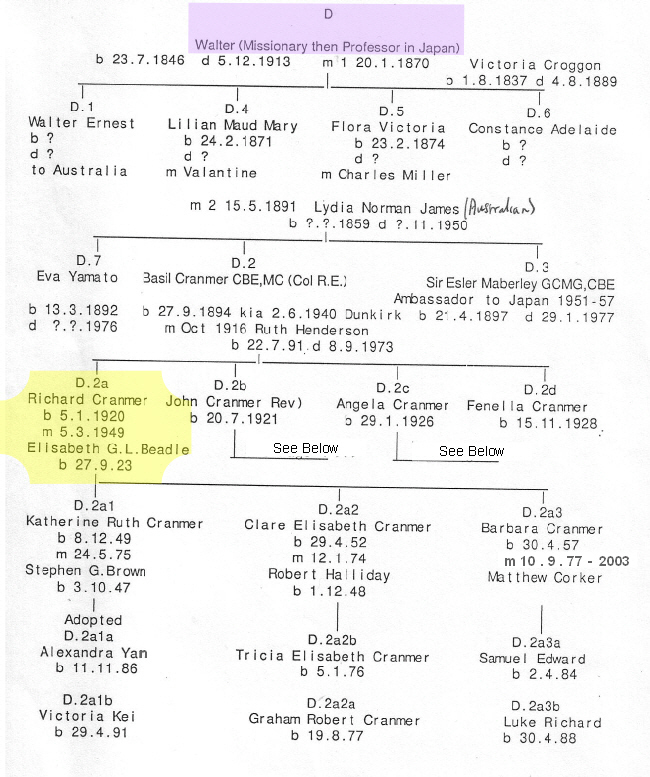 Cranmer was adopted as a middle name in Walter's branch of the family because there was some ancestral link with Archbishop Thomas Cranmer, albeit on the wrong side of the blanket! These details were compiled by the late Major-General Roland Dening in June 1964. They have been added to or corrected by Commander Neil Wishart and also updated by Richard (Tim) Dening. Obituary Notice for Basil Cranmer Dening, Richard Cranmer Dening's father here.